Working in Offices, Lobbies, Airports, Restaurants and Malls � Space Densification Takes Hold! People often wonder when the concept of shared space really began. 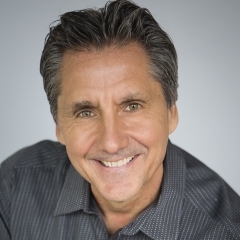 For me, it began in 1987 when our director of sales told our salespeople they were closing all branch offices and sending us home with a personal computer, 2,400 baud modem and a link to corporate � where our assistant would be shared among four of us. To say we were outraged would be an understatement. We lost our office, personal assistant and of course, our three-hour commute. During this period, we also saw major corporations such as IBM and Deloitte trying to figure out what this new form of mobility � enabled by personal computers and laptops � meant to their workplace strategies. They began to experiment in major office complexes in cities such as Los Angeles. IBM sent many people home from their office on Hope Street and Deloitte introduced the concept of a shared desk in their South Bay office. 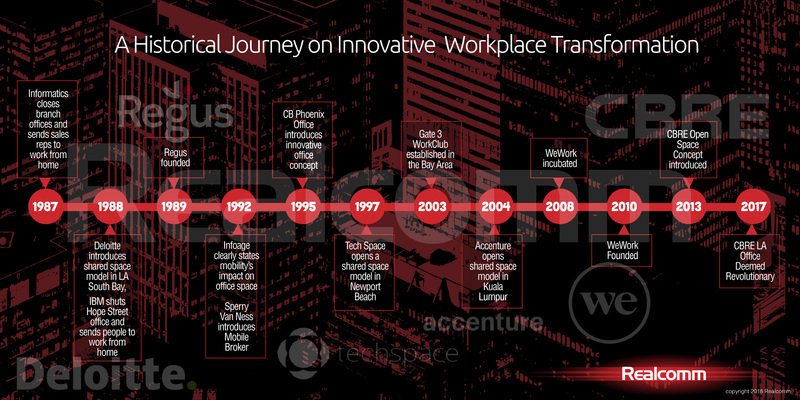 In 1989, Regus was founded, and a new era of mobile employees began to reshape how and where we worked. Fast forward to 2008, when the first WeWork ideas were incubated, to today in 2019. It is safe to say that the Co-Working, Flex Space, Shared Space, Hot Desks (and any other name we want to assign) revolution is in full swing. Every commercial owner and corporate real estate executive, as well as anyone else in the industry, is trying to figure out exactly how this will evolve. We are now seeing the office model even making its way to restaurants and retail spaces, with underutilized space being offered as a workplace option. Additional factors include the ability to work anywhere today, such as airports, coffee shops, hotel lobbies, planes, park benches and more. Just as the laptop computer was the technological piece of the puzzle that started the revolution, mobile devices, enhanced communications speeds, the cloud and a multitude of easy to use web-based collaboration tools are the technologies that continue to enhance our ability to work remotely. Video conferencing, real-time document collaboration, VoIP, messaging, email, company intranets and other technology solutions are just some of the tools making the 'office' available anywhere. At the core of this phenomenon is the concept of space densification. Not long ago, 250-350 square feet per person was common. Over the years, we saw it dip all the way down to 75 square feet per person, with some extreme examples even going as low as 25. What seems to be the norm today is in the 125-150 square feet range. While actual worker space has gone down, the space dedicated to amenities is rising. Coffee shops, game rooms, meet-up areas (that look very different from traditional conference rooms), as well as health-inspired spaces are all making their way into our workplaces. The oversimplified thinking goes like this: if we can eliminate the underutilized space, we may have money to pay for these new amenities. In the end, the overall spaces are smaller, smarter and much more engaging. In the last 24 months, we have seen a race to densify and at the same time provide a flex space option to the marketplace. In the owner world, we are seeing floors 1 and 2 reconfigured as a shared space option, with amenities such as conference space, meeting rooms and coffee shops. A landlord will provide the upstairs tenant (that is trying to eliminate the 30-50% underutilized space in their office) a flex option on the bottom floor that can handle any overflow on days of high occupancy. The landlord can also offer this flex space to the general public, ensuring very high occupancy � and more importantly, utilization rates. As mentioned above, there are even restaurants and bars that are getting into the game. A quick look at the utilization patterns of a restaurant shows plenty of times that they are not fully used. Given that they usually already have WiFi, have tables to work at and are typically well designed and inviting, it makes sense that they would offer their space to add to an existing revenue stream. There is also a pretty good chance that these mobile warriors would be interested in something to eat and drink. And finally, let us not forget the good old 'kitchen table'. For many years, the kitchen table has served as a place to respond to emails, write proposals, have meetings, start businesses and basically get work done. The topic of coworking, flex space and Space as a Service will be a major theme at Realcomm | IBcon 2019, to be held in Nashville, TN on June 13 & 14 (Golf and RE Tech Tours June 11 | Pre-Con Events: June 12). Join us as we gain perspective from thought leaders representing the owner, corporate user and service providers as well as companies dedicated to providing Space as a Service. Register early and save! Tridium is a world leader in business application frameworks, advancing open data environments and easy interoperability. Our Niagara Framework� universal multi-protocol integration engine has fundamentally changed the way people connect and control devices and systems. Tridium delivers Niagara software and the JACE� controller and server platform through an open distribution business model with open protocol support. With almost one million instances worldwide, Niagara is helping a significant number of businesses, manufacturing enterprises and government entities improve performance and reduce energy, operating and other costs, and be more strategic and competitive. The Niagara Community is a large and active community of innovative developers, integrators, consultants, manufacturers, resellers and end users who use Niagara daily. Tridium is an independent business entity of Honeywell International. Be a part of one of the most interactive and exciting sessions of the conference, the Smart Building Best Practice Showcase, which will be held on June 14 from 8:30am to 10:30am. 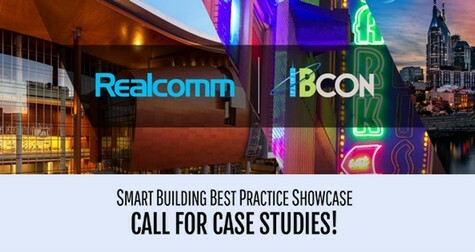 The Showcase presents the world�s most successful implementations of smart buildings, campuses, and portfolios. These projects represent the future of real estate with their state-of-the art design, connectivity, systems integration and enhanced occupant experience. For the past six years, this event has featured over 200 smart projects by Google, Microsoft, LinkedIn, Ford Land Energy, Stanford University, Aruba and many more! If you are involved with a smart building, campus, portfolio or city project you feel would add significant value to the Showcase, please contact Tina Danielsen.